The ENDADA Music & Arts Festival has teamed up with JOYmealz to provide a fundraising opportunity that promotes more time together at home enjoying family meals. 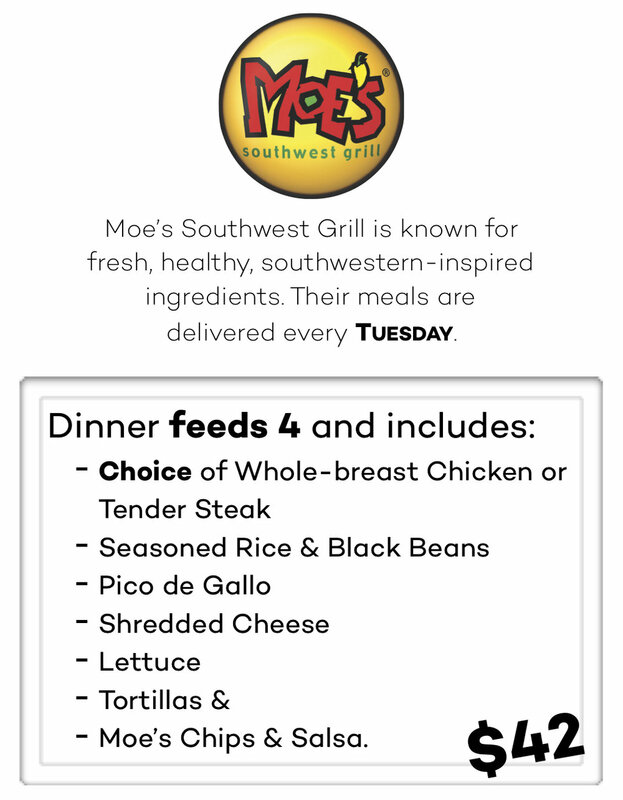 Families can sign up for weekly subscriptions to Moe’s or Stroud’s for a 4-person meal delivered to your front door in an insulated bag - fully cooked - saving you time-demanding tasks of meal planning, grocery shopping, cooking, and cleaning. It is delivered chilled with ice packs and will stay fresh and ready to reheat in the refrigerator for 3 to 5 days. JOYmealz plans to add more restaurants to its offering as it expands in the coming months. Updates can be found at http://twitter.com/JOYmealz. Simply choose one or both participating restaurants, go to the corresponding website below, click “Get Started”, choose your meal, pick your protein, add to cart, check out with the MBAarts coupon code & dinner is served! By using the COUPON: MBAarts, MBA’s ENDADA will receive 10% of the sales of each meal, weekly. The program uses fixed pricing that does not change week to week and the proceeds will go directly to ENDADA to support the visual and performing arts. Know others who could use this service? Share the link below with them and make sure to tell them to sign up with the code MBAarts as well. ENDADA is hoping to get at least 50 meal subscribers per week in order to continue to bring new and exciting interactive art components to the festival. We are excited to share this service with you because it is designed specifically to simplify your life and provide quality food and time for your family. All the businesses involved have ties to MBA. Moe's is connected to Scott '84 & McClain Portis '18, Stroud’s is connected to Zeke Stroud '24, and JOYmealz is connected to John '22 & Jordan Dayani '24. Please see the attached flyer to learn more. You can change your protein selection or skip a delivery before a preset deadline late in the week prior to the delivery date. If you have any questions about the process, you can check out their FAQs on the website below or contact: info@joymealz.com. Click on the restaurant logo below for the subscription in which you are interested. Weekly DELIVERY to your home is INCLUDED.